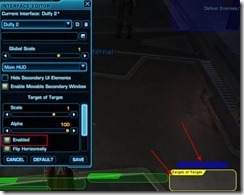 Hey everyone, UI customization is a brand new feature bundled with patch 1.2. It is definitely something that should have been here since launch but as they say, it is better to be late than never! Most of the customization options are fairly simple and self-explanatory but I still want go over it with you in case there are some hidden gems you might have missed! 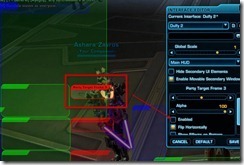 The first thing you will notice when you hit Esc to access the other menus is the brand new Interface Editor button. 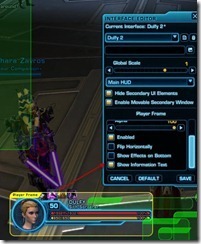 This is the place to change pretty much everything interface related now, including the Operation frames. Now when you click that button, a whole bunch of windows pop up! So just a word about the coloring of the windows. Green means that this particular window is enabled and active on the screen right now. Blue means that this particular window is enabled but only active on the screen in special circumstances (i.e. 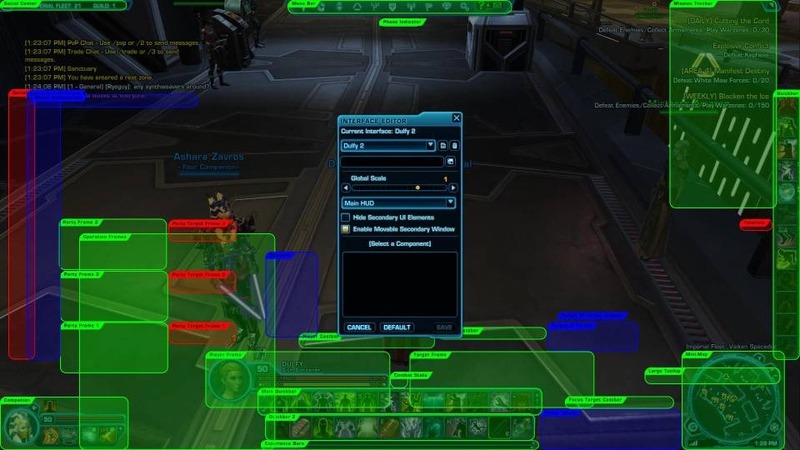 Focus target window is only active if you target someone and press the focus target button: Alt –f). Red means that particular window is disabled but you can go click it and enable it yourself if you need. 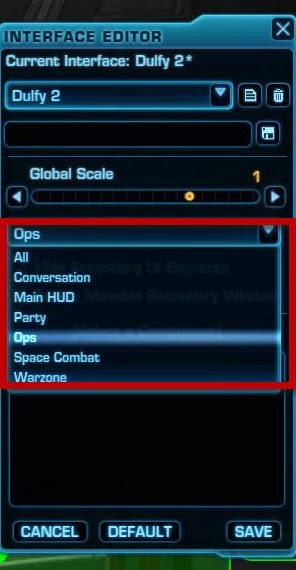 If you just want to see a subset of windows, you can select from a list and modify windows for that particular situation: All, Conversation, Main HUD, Party, Ops, Space Combat, Warzone. One last important thing to mention about the editor window is the saving and loading profiles. You can save new profiles by typing in their name in the space where test1 exists and click on the save button next to it. You can also pick an existing profile from the top, change it, and then press the save button at the bottom to save the changes. 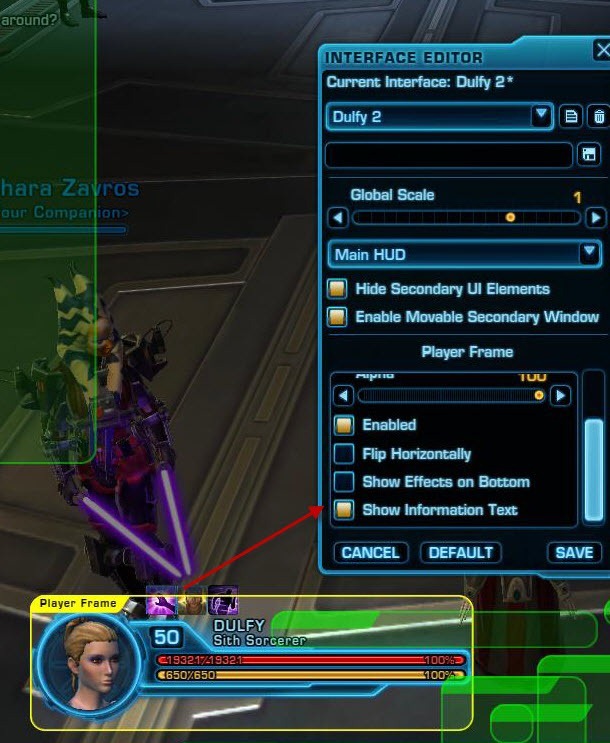 These profiles are all saved as XML files and they are located in C:\Users\USERNAME\AppData\Local\SWTOR\publictest\settings\GUIProfiles for windows 7. Now notice where it says publictest? 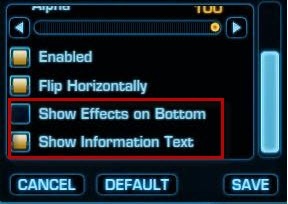 This is likely change once 1.2 patch goes live so you might have to change it to say this instead. Here is my directory, you need to change Kristina to your account name on your computer. 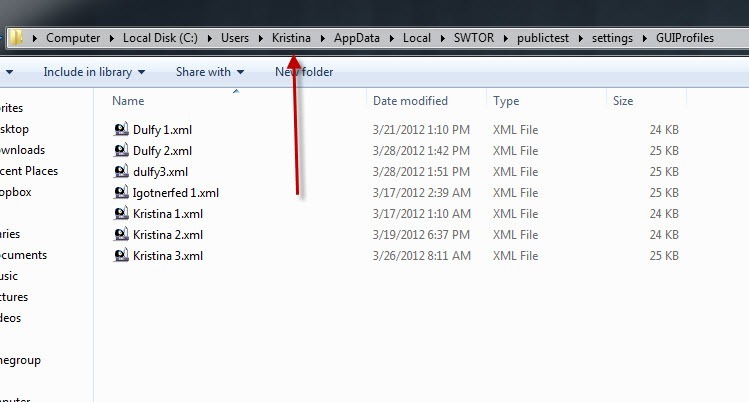 For some of you, you may not see the AppData folder. 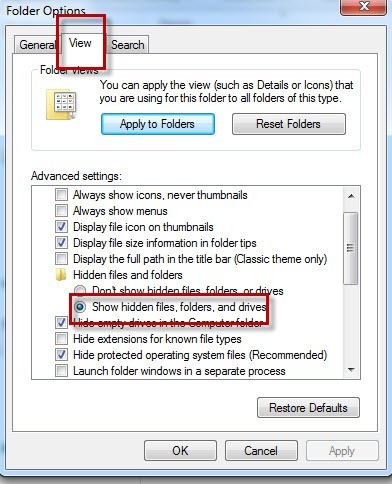 If you don’t see it, it is because that folder is hidden by default. You need to unhide it. 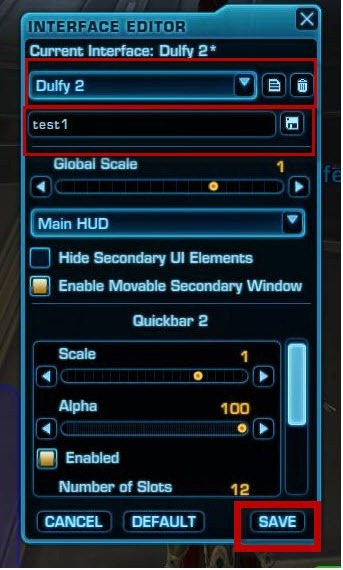 You may need to unhide folders and change publictest to swtor as well. 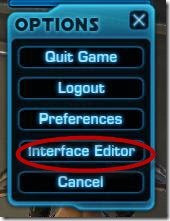 One last thing I want to mention is that you can also quickly load the interfaces you have saved without having to go through the interface editor. 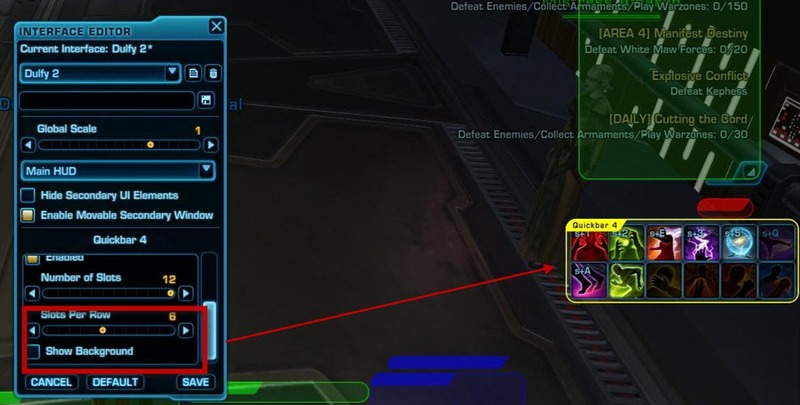 So if you have one for PvP and one for PvE you can quickly switch between the two by pressing the + button to the left of your bottom quickbars. One of the big things that come with the ability to customize your UI is the target of target window. This feature has being in demand since launch and 3 months later we finally got what we asked for! 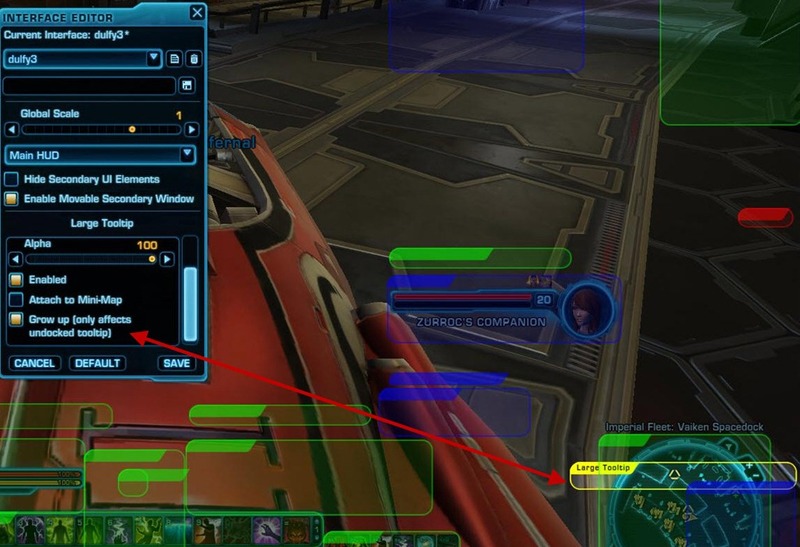 For those not familiar, target of target window shows you what your target is targeting, this allow tanks to see who has aggro, raid leaders to see who is attacking what etc. 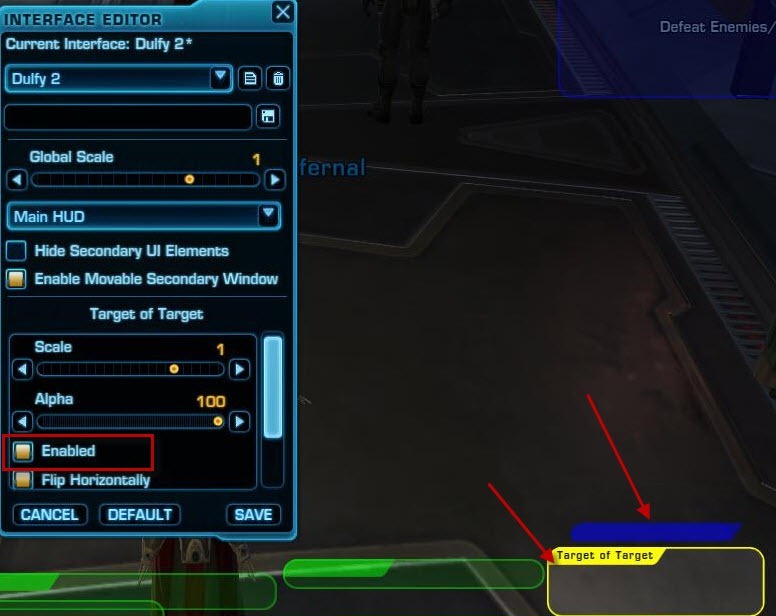 Previously if you want to see what your target was attacking, you had to target them and press Alt + t.
This feature might be disabled initially so you may need to click on it and enable it. The little blue bar at the top is the Target of Target Castbar, which you can move around/resize it as need. 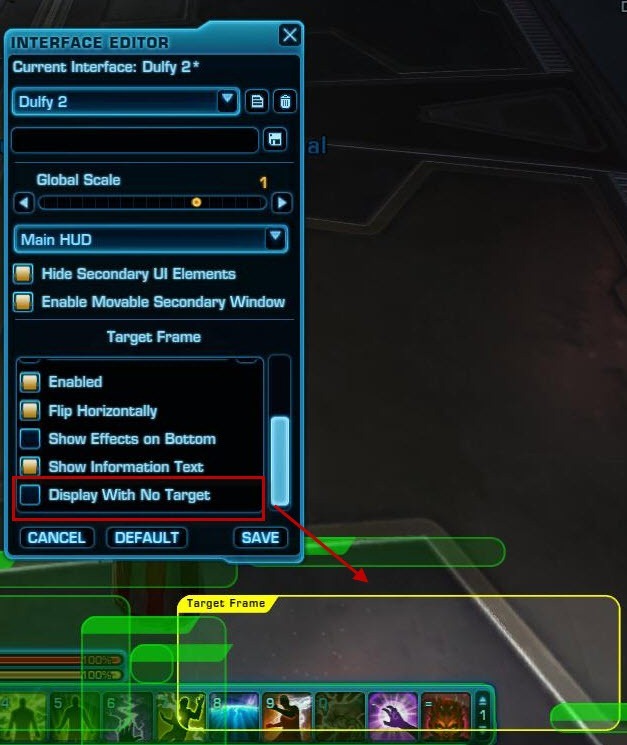 The target window has gained a new option in addition to the ones above: ability to hide when you have no target selected! 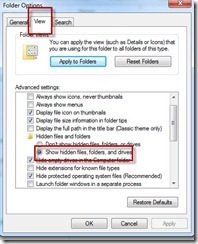 This is pretty handy and helps to reduce clutter on the screen! Don’t forget you can also apply some of the same options to your player frame – show effects on bottom and show information text – this will show your exact health & resource % and numbers. Focus target – I get asked a lot in the videos if I posted on youtube if I have somehow figured how to enable target of target window. What people are seeing instead is the focus target window which I like to use on the bosses as a healer so I know exactly what % the boss is at. 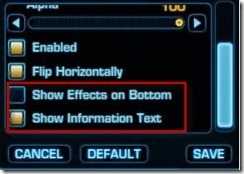 To enable focus target, go to preferences –> controls –> enable focus target. Once you done that, you can click on a boss/person and hit alt + f and that will put them in the focus target spot. Unfortunately, there is currently no way to know the exact health % of the person/mob on the focus target so you just have to guesstimate! Oh one last thing, if you use party frame for groups (I use Operation frame myself) you can choose to enable party target frames for each party member. 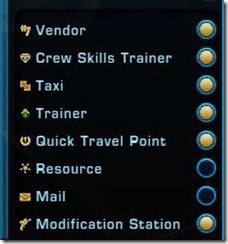 They are disabled by default but if you need to micro-manage everyone in the group this is a good way to do it! 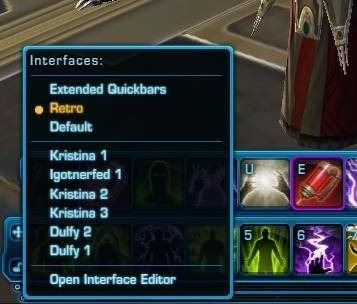 Do you ever find your quickbars are too big? Maybe you don’t like horizontal/vertical bars that clutter your screen? Come 1.2, you will be able to make them smaller/bigger and reform into different rectangle shapes. What I did here is to make my bottom 2 bars small (about 0.8 in size) and rearranged the two vertical bars and put them side by side near the bottom bars. Since I am not much of a clicker, I just want to see some of their cooldowns and they don’t need to be too big for that. 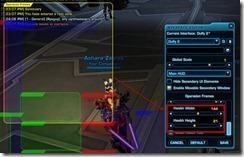 If you have being using the preferences to adjust your Ops frames, you need to do this via the Interface Editor now. You can change the groups per row etc but that concerns me as a healer is the width and height of the health bars. 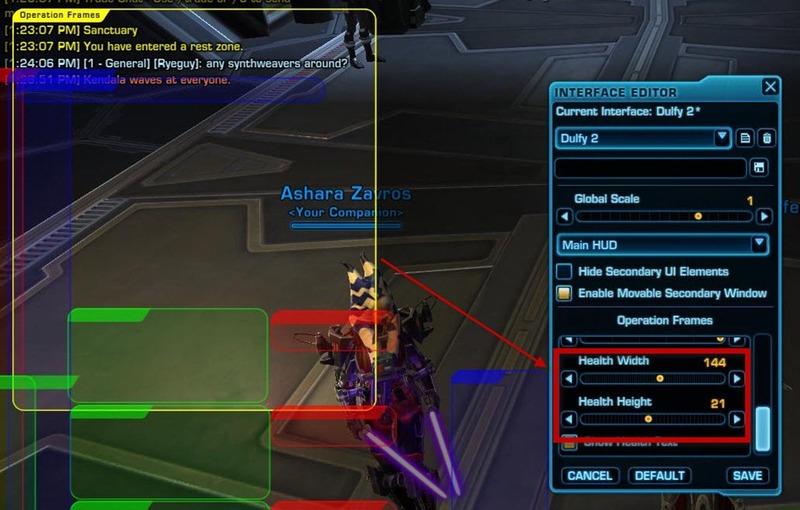 Just click on the Operation frames and scroll down a bit in the options to adjust the Health bar width/height. Show health text will display their health numbers, which I find pretty handy. Unfortunately there is no way specifically enlarge the buff/debuff icons other than enlarge the entire operation window. This might be something in the works for the future but currently most fights do not have a strict cleansing requirement so this isn’t too big of a deal. 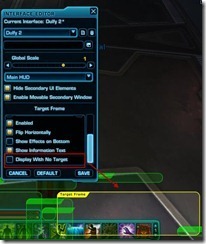 One of my pet peeves about the default UI is the huge tooltips that block everything. Luckily you can now move that tooltip around ( need to detach it from the mini map first) and resize it as need. You used to be only able to apply one filter (i.e. vendor, trainer) etc to the world map, this made finding things a bit hard. 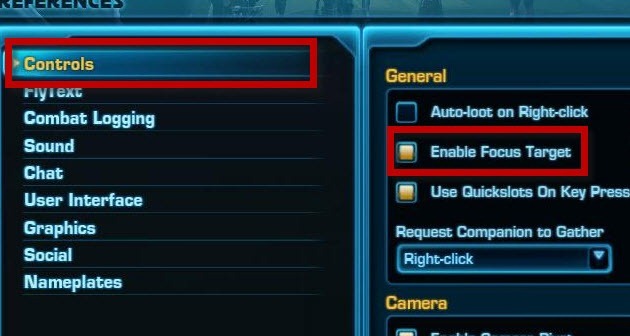 In 1.2, you will ne able to enable multiple filters at once!! 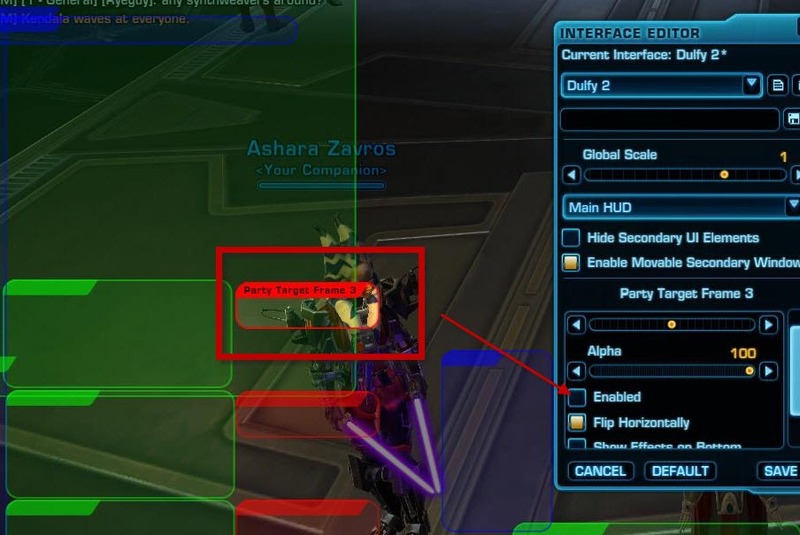 Simply go to Preferences –> UI and then click on allow multiple filters to be enabled simultaneously on the world map! Just one word about the mission tracker. Like other windows, you can resize it freely. I had issues previously with it blocking view but not anymore! I got a few requests to post my own UI. So here you can see my UI in its entirety! It is a bit large so it may take a few to load but I annotated the window positions so you can see exactly where is where. There is also a UI sharing tool on sithwarrior.com where UI posts their favourite UI and UIs are ranked by # of downloads. 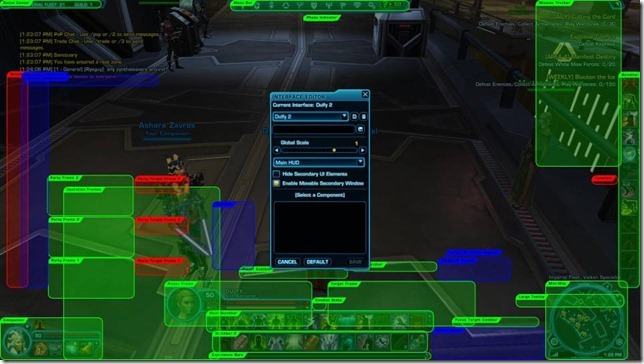 It is not being used too much as only folks on the PTS can save/load UI layouts but it should pick up once 1.2 goes live. I will link you to the Reddit thread so you can see some of the comments as well! Did they add skill target forwarding? Yeah, or target the tank and your attacks hit the boss. Loved that feature in LOTRO. 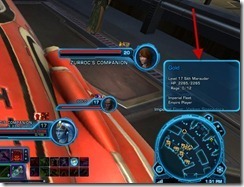 “Target of Target” is normally a UI feature. 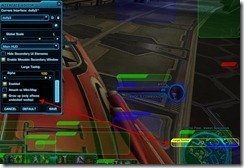 “Skill Target Forwarding” allows your skills to pass through your target and hit your targets target. It allows healers to target the tank and heal them but also use damage skills to hit the tanks target without having to click the tanks target. Awesome write up!! I cant wait for 1.2 I so love that with Target of Target and all that Jazz. I think this UI customization is what I’m most excited about 1.2 oh and the New OP’s. Just a general shout out. 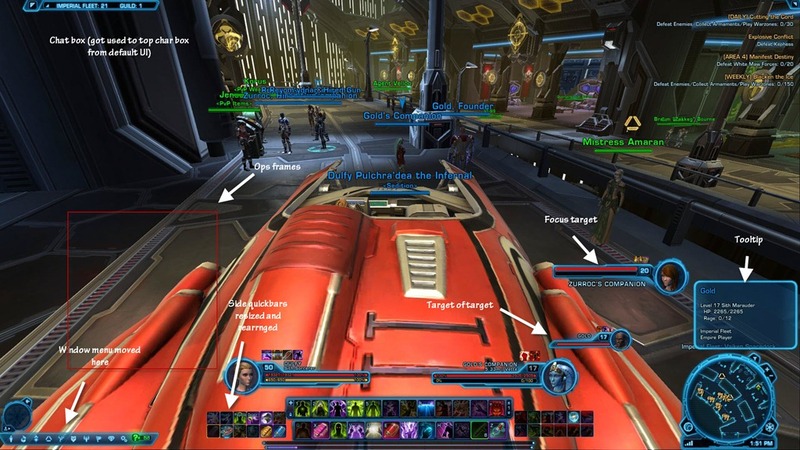 Dulfy, you have an amazing swtor information site and do a great job of presenting information in well thought out ways. If I had to guess I’d say you were a teacher by trade, or will be if you stop slacking. Great guide, thank you :). 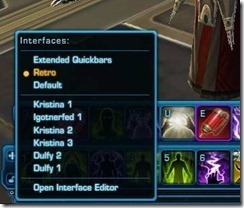 One question though, is there any way to add an additional toolbar/quickbar in 1.2? Is your UI going to be available to download?